First off, apologies for the snail’s pace at which I’m rolling out the Tokyo posts. I’m hoping to step it up a gear and churn out a steady stream in the next week or so. In the meantime, I’d like to bring to your attention a new Japanese gem closer to home. Sprung up on sleepy Jerusalem Passage in Clerkenwell a short few weeks ago, Sushi Tetsu has already garnered a loyal following of regulars (I myself will be making my fifth visit this weekend) who have long been thirsting for an authentic edomae sushi-ya to grace our shores. I must admit I’ve deliberately dragged my heels a little on this one, reluctant as I am to send even more people flocking to this treasure of a place. Run by chef Toru Takahashi and his wife Harumi, this 7-seater restaurant stays true to the traditional model of a sushi bar – more so than anything else in London. The fish is sourced mainly from Billingsgate and everything I have sampled there thus far has been excellent. 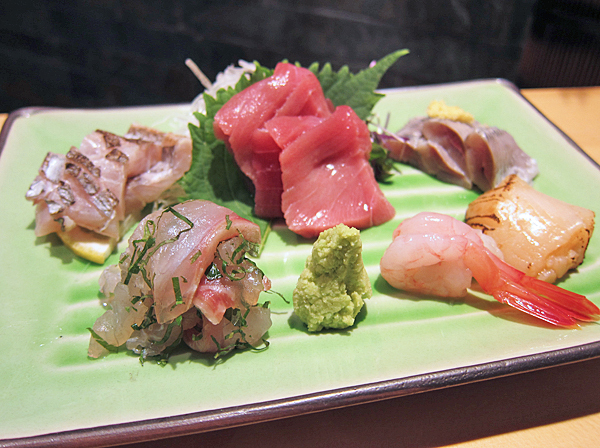 A recent sashimi assortment included stunning rich Sardines, gleaming silky Chu-toro, plump scorched Scallops and the clean flavours of Sea Bream tossed with shredded shiso. The menu features various sets (ranging from £9.80-£24.80 at lunch, and £20-£38 in the evening), as well as sushi and sashimi à la carte. I prefer to leave the selection in the capable hands of Toru-san, asking him to choose the best of the day’s haul. 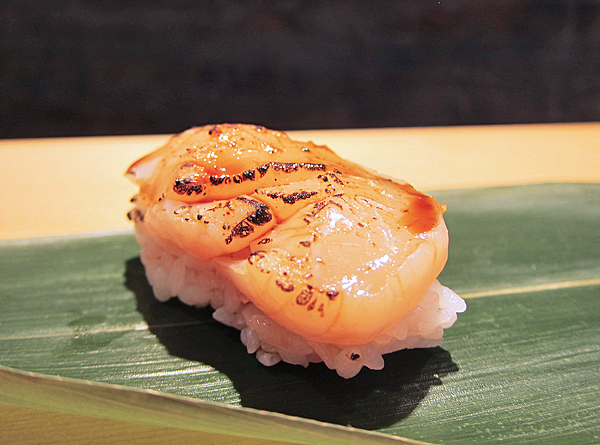 Beware if you choose to take this route as the beautifully formed nigiri is so moreish that it’s quite easy to rack up a substantial bill – especially if you order that extra slice or two of o-toro! Toru-san crafts and presents the sushi piece by piece, placing it on a fresh bamboo leaf in front of the diner to be eaten immediately by hand (as it is done traditionally – a wet napkin is provided to clean fingers between pieces) or with chopsticks. Personally I enjoy the tactile intimacy of eating with my fingers. 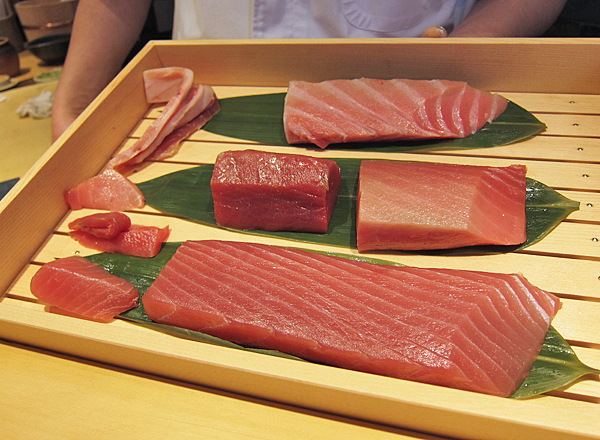 A dish for soy sauce is offered, but not necessary. 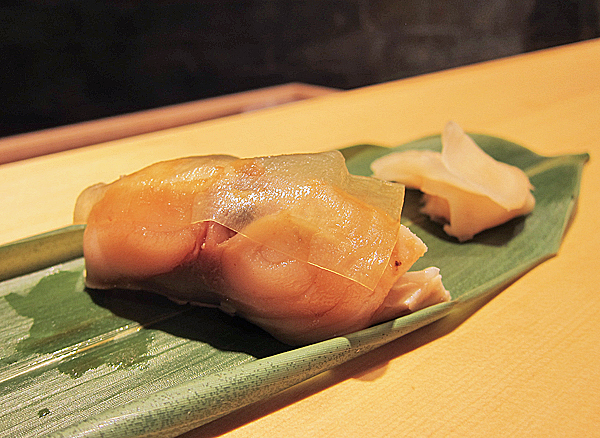 Toru-san seasons each perfectly, customising according to the tane (topping). 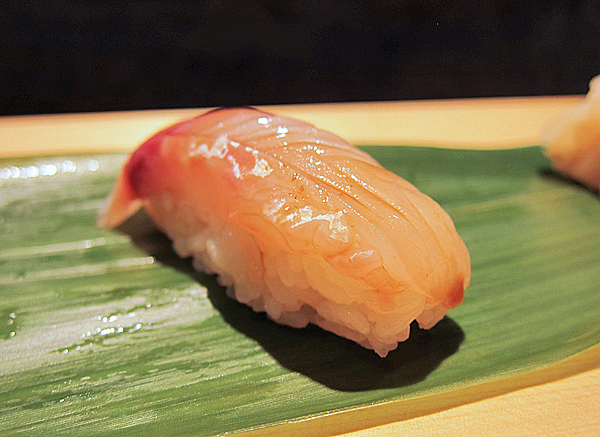 His sushi-meshi (vinegared rice) boasts an excellent balance of sweetness, acidity and savouriness that makes it an all-rounder that matches as well with a delicate Hirame (flounder) as it does with a creamy slab of Hamachi (yellowtail). Tuna is undoubtably the most prized fish for the Japanese and on most days Toru-san will have a number of cuts varying in fattiness (and sometimes in origin – he has served me both Spanish and Croatian varieties) tucked snuggly in one of his storage boxes. 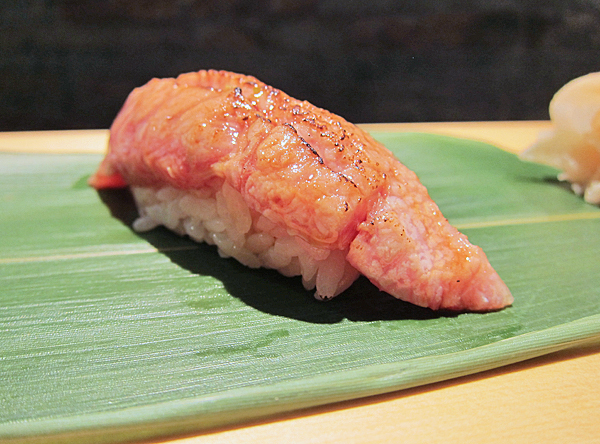 The Akami (lean tuna) at your standard sushi chain is often pale, sinewy and watered-down in taste – nothing like this vibrant jewel-red specimen which was succulent and intensely flavourful. 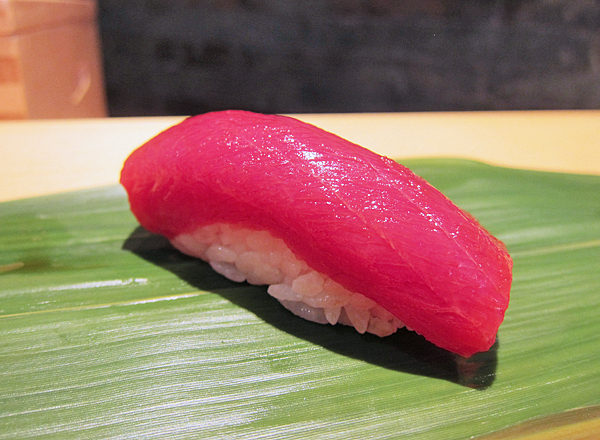 Chu-toro (medium fatty tuna) was even better – a thick blanket of luxurious velvety melt-in-the-mouth goodness. 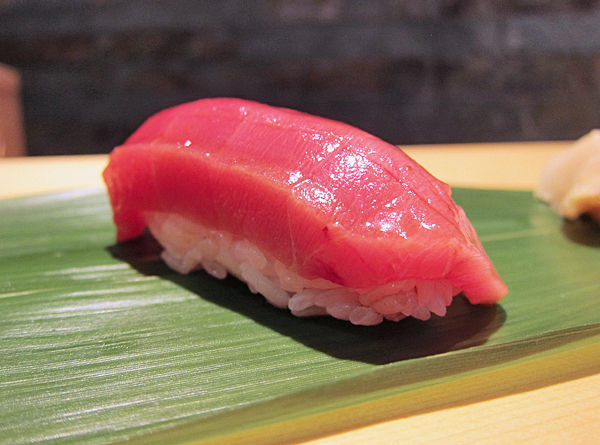 A favourite of many, O-toro (fatty tuna) had a richer taste, with an oilier mouth-feel. Toru-san assesses each tuna he receives from his supplier to determine whether or not to age the fish for a few days to enhance/develop its flavour. 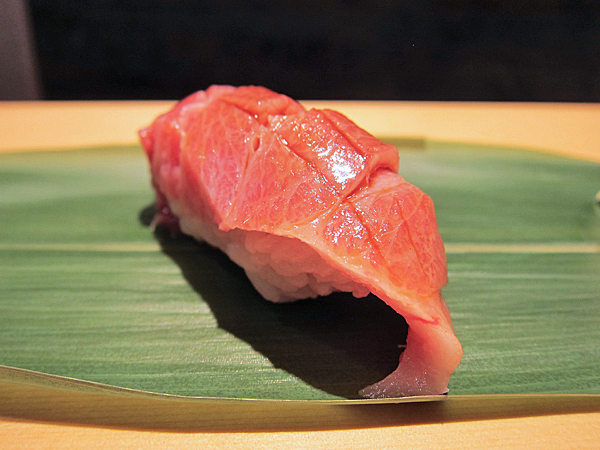 Depending on the day’s delivery, the level of marbling in the tuna can vary greatly – this O-toro nigiri which I was served on another day had a much greater fat content. The higher level of fattiness lends itself to blow-torching (the sear softens the sinews and releases a tantalising aroma) so Toru-san served a second portion aburi. This preparation was the superior of the two – smoky, less greasy on the palate and practically disintegrating on the tongue. 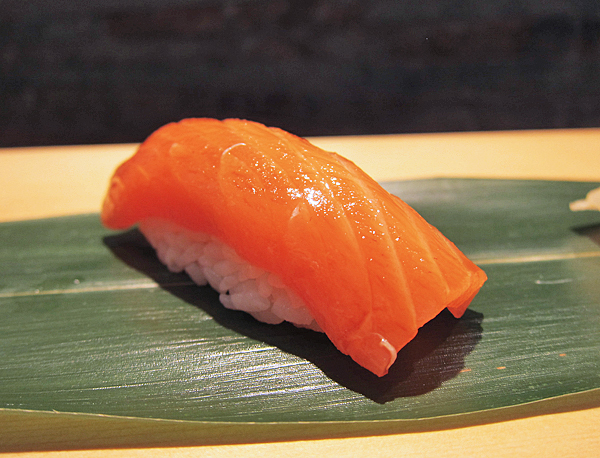 Although hugely popular in the western world, salmon is not a typical sushi choice in Japan. 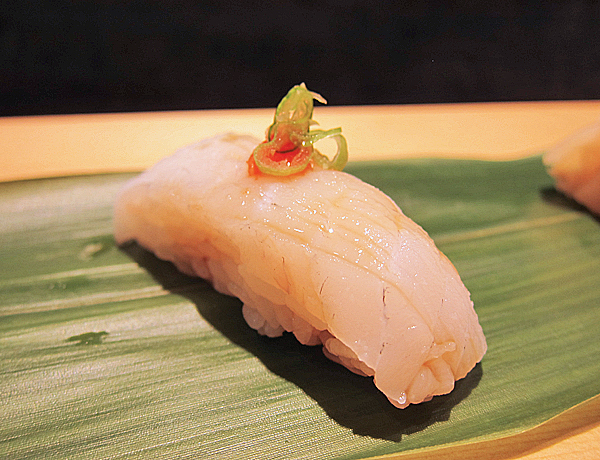 In fact you won’t even find it on the menu at many of the top sushi-yas in Tokyo. I can usually do without it but was curious to try the Sake from Toru-san’s stash. To my surprise it was quite unlike any I’ve had before – with a denser balik-like consistency and more concentrated salmon flavour. Often I find Razor Clam served raw to have a more than a hint of fishiness which can be off-putting. 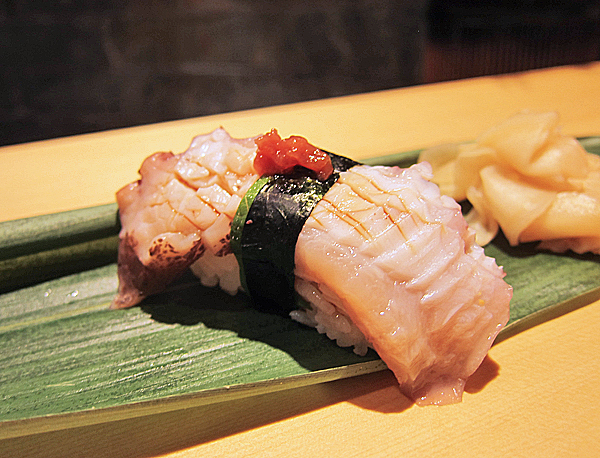 Tetsu’s flame-kissed version however was a revelation – sweet, tender with a slight crunch and tasting of the sea. 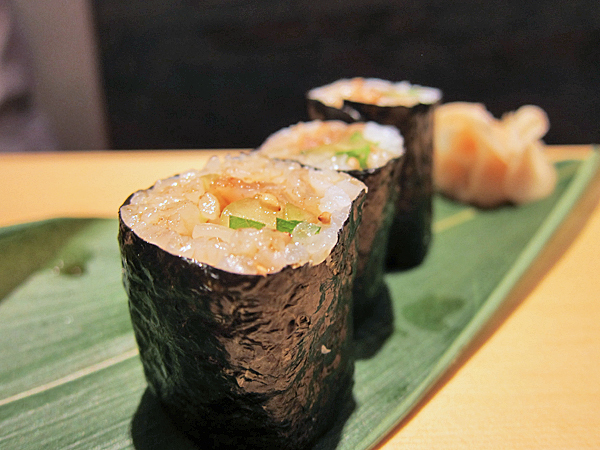 Another unexpected standout was the Ebi. Freshly-shelled and cooked slightly under, it was quickly torched on the cut side before being placed on a mound of rice and brushed with soy. 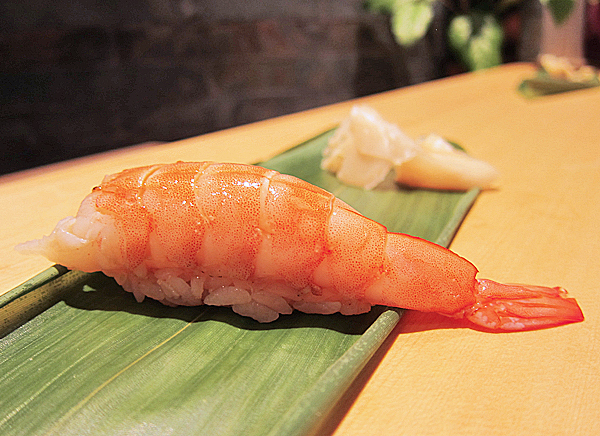 I’ve had many a dry and bland boiled prawn nigiri, and this was like none of those – juicy and supple, with a well-judged balance of sweet and brine. 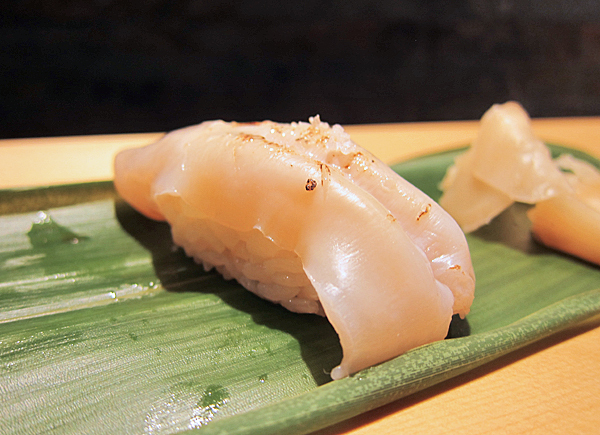 Lovely fat Hotate (scallop), lightly blistered, was smooth and creamy in the mouth. Sublime. Most of the fish was simply treated with a slick of seasoned soy but Toru-san is not averse to slightly more elaborate garnishes if warranted. 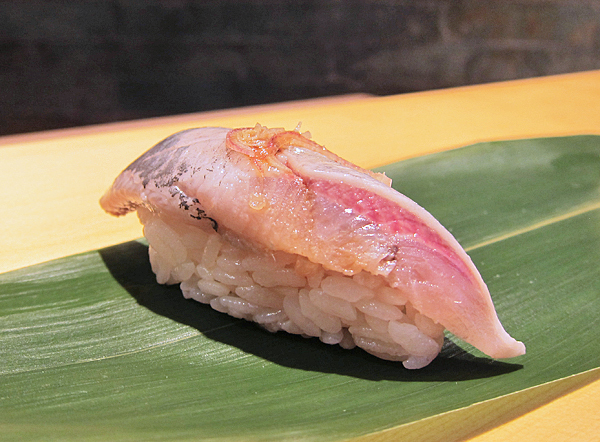 Vinegary cured Saba was presented covered with a paper-thin rectangle of marinated kombu that countered the mackerel’s oiliness perfectly. Toru-san painstakingly massages his Tako for an hour and it shows – the lightly seared octopus, nicely accented with a dab of umeboshi (salted plum) and bound to the rice with a strip of nori, was incredibly soft and tender. Swordfish was briefly marinated in soy and a house-made sauce, wiped clean then slashed in a criss-cross pattern before being blow-torched and topped with negi and togarashi. There was a satisfying robustness – the swordfish more akin in texture to meat than fish. Aside from nigiri you can also order temaki (hand rolls) and maki. This unusual maki of scallop frills and cucumber was light and refreshing, with an intriguing mix of crunchiness from both the shellfish and vegetable. 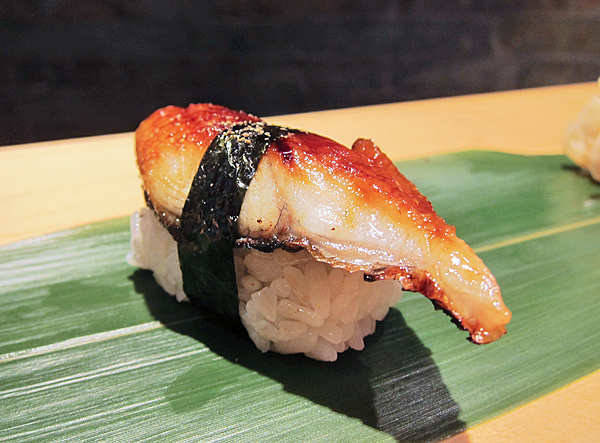 Unagi with its sweetness is always a great way to end a sushi flight and this piece was exemplary. I could not help but smile as I slowly savoured it. 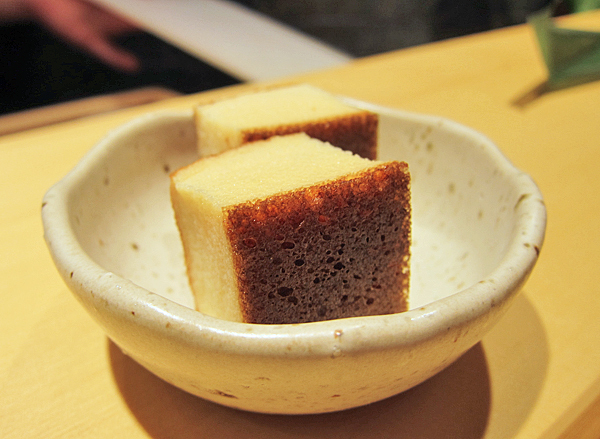 Tamago, as much an indicator of the itamae‘s ability as his knife skills or sushi-meshi, takes the place of dessert. Toru-san is constantly tweaking his tamago recipe, but all versions I’ve tasted have been moist, spongy and airy with a depth of flavour from the addition of ground fish and shrimp. If it isn’t already blindingly apparent – I love this place. And it’s not just the well-crafted sushi that has stolen my heart. Every time I step into that tiny yet perfectly formed space, the zen minimalist interiors and warmth of the animated chef and his delightful wife transport me to a very happy place. I have long lamented the lack of proper sushi in London, but with the arrival of Sushi Tetsu I need fret no longer. ~ by gourmettraveller on July 13, 2012.
oh my days. I must go ASAP. Beautiful pics. I was there for lunch last week and as you did, I fell in love with it. The warmth welcome and minimalistic and quiet set transported me back to a sushi bar in Tokyo! Very nice post with well-composed, clear close-up photos and interesting descriptions. I don’t think that salmon is all that rare in Japanese sushi. I was last in Japan during the Iceland volcano eruption. There was an article in the Japan Times that one probably would not find salmon that week as the Jumbo Cargo plane filled with nothing but fresh salmon that flies from Oslo to Tokyo every day was grounded. Thanks Michael! 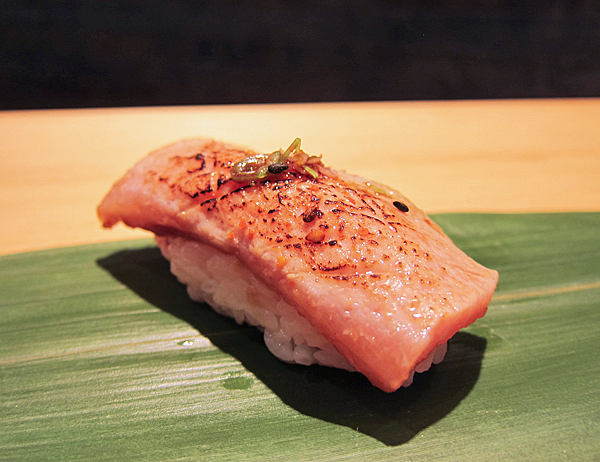 Salmon was never part of traditional edomae sushi – from what I understand it is due to salmon only being found around the waters of Hokkaido (the northenmost island of Japan) making it impossible to transport the fish fresh to any considerable distance. 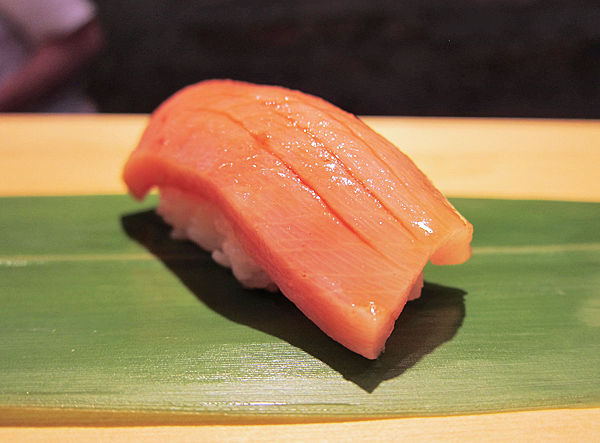 As you pointed out it is definitely more common now than it once was, but it’s still not considered one of the top choices and out of tradition many of the top end sushi-yas in Japan do not offer it (both the Michelin-starred Sukiyabashi Jiro and Sushi Sawada did not feature salmon when I ate there this Spring). Great post. Will definitely be waddling down there to try it tomorrow! You won’t be disappointed! However maybe give them a ring to book for next week – they close Saturday lunch (and all day Sunday), and are booked out for a private dinner tomorrow evening. Oh, thanks a lot for the heads-up. Will book for sometime next week. stunning pictures ugh so tasty looking. This looks fab, beautiful and authentic. Jerusalem passage continues its run as an unbeatable destination, both for dining and drinking. Many thanks to introduce us a proper sushi restaurant. There aren’t many sushi places I would feel urged to try in London, but I am now looking for the date when I can go to this place. 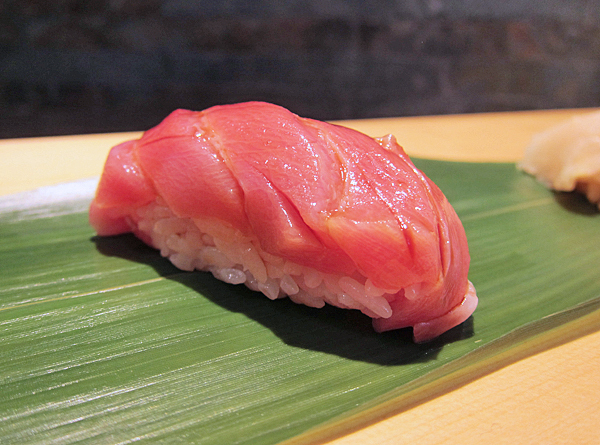 What a joy to see those beautiful pictures of sushi!